I am soooooooooo tired! It has been non stop since this morning. 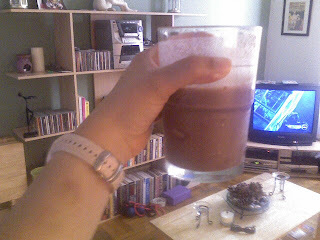 I slept in and for me "sleeping in" is around 8 am lol....For Breakfast I had 2 scoops of Light Muscle Milk before heading to Yoga. Class was really great today. She really challenged us, to the point that I had sweat dripping down my entire body and I was sliding on my mat lol. I burned 307 calories in Yoga and walking there and back burned a total of 303 calories. After class I went to the vet to get Koko's meds and then went to the supermarket to get some things for the week. I stocked up on more Oikos...I can't wait to try Blueberry. 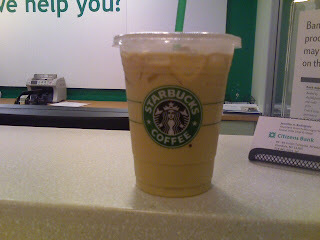 After that, I went to get my niece and picked up a Iced Grande Skinny Vanilla Latte which totally cooled me down. 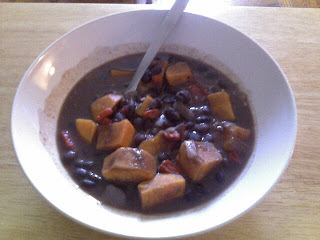 But then I heated myself up again with a cup of Black Beans mixed with Onions, Peppers, and Sweet Potato.